In addtion to background information, this page contains five blogs, just click on the links immediately below if you want to go directly to a blog. The reason they are on one page is that together they illustrate that there is more than one way to mess up both compliance with EC law and care for the public interest in the case of the Scottish ferry network. Even though the four tenders discussed below have been framed to supposedly comply with the same EC laws on competition and State Aid, the previous Executive (1999-2007) or its agencies have found different ways to fail to deliver the public interest in each case, despite clear and coherent advice being given to them over several years by responsible authorities. The major issues here involve four separate tenders for ferry services under consideration by the previous Scottish Executive (1999-2007), in the context of EC Maritime Cabotage and State Aid law. Despite the fact that there are well established systems and processes by which tendering of such services could and should be carried out in an orderly and integrated fashion to protect the public interest, the four very different arrangements being made here by the Executive are ad hoc and flawed. Each tender, some of the dangers that the taxpayer, users and dependent communities are being exposed to, and updates on what is happening in each tender, are discussed further below. In the debate in the Scottish Parliament on the Executive's proposed tendering of CalMac services (14th September, 2005), the Parliament voted in favour. My work and submissions were referred to frequently during the debate by Ministers and opposition MSPs but were not represented accurately by Ministers. The debate can be read in the Official Report, and my reply Comments on SE handling of Tendering for Ferry Services under EC law can be read here. This document summarises my criticism of the previous Scottish Executive's handling of all four tenders, indicates just some of the problems that may still arise, and signposts how a coherent and integrated set of proposals could still be developed here that builds on the considerable body of economic and regulatory experience in how to deal with regulated essential services in many contexts, including the UK. The subsequent updates and notes below regarding what is happening in each of these four tenders or proposed tenders should be read in conjunction with the Comments letter. See also my original submission to the consultation process on the proposed CalMac tendering process, appendices in the submission include Gourock-Dunoon, the Northern Isles retender and the crucial question of Operator of Last Resort. It effectively means that the previous Executive's decision not to award Public Service Obligations (PSOs) on CalMac and other lifeline ferry routes means that any subsidy past present or future on these routes is in danger of being judged illegal State aid under EC rules. In answers to a series of questions filed by Jim Mather MSP, the Executive confirmed it has not imposed, and does not intend to impose, PSOs on any of the four tenders for which it currently has responsibility under EC Maritime Cabotage and State aid rules, that is for the CalMac routes, the Northern Isles routes, the Gourock-Dunoon route, and the Campbeltown-Ballycastle route. At some point soon after the 2003 Scottish Parliament election it now appears the previous Executive began regarding the two important EC devices here, PSOs (Public Service Obligations) and PSCs (Public Service Contracts) as alternative, and not complementary, measures. Certainly they have recently confirmed that is how they regard these measures. That is the source of their subsequent errors, from that single misinterpretation by the Executive everything else follows. PSOs and PSCs are alternatives only in the sense that knifes and forks are alternatives. If you want to pick up - you fork, if you want to cut - you knife. if you want to eat, then it can be helpful to use knives and forks together as complementary tools. Similarly with PSOs and PSCs. If you want to subsidise an essential service - you must impose a PSO. if you want to assure regularity of service - you can impose a PSC. If you want to subsidise a regular service - you can use PSOs and PSCs as complementary tools, but if you subsidise you must use PSO whatever you do, whether or not you use a PSC to ensure regular and adequate quality service. That is the gist of EC rules based on statements by the Commission and judgments by the European Court. That is what the CalMac PSO answer confirmed. But if you think PSOs and PSCs are alternatives (as the Executive does) and don't use PSO, you cannot subsidise here, it's illegal State aid. It's as simple as that. The previous Executive were recklessly and wilfully threatening the continuance of these lifeline services, not to mention the welfare of the users, dependent communities and the taxpayer in the process. In addition, the Executive's agency (SPFA)'s tendering process for a £5 million fisheries protection patrol ship discussed below (General issues blog for 3rd, 11th, and 12th June)comes under the same EC State aid laws (but not the same sector-specific laws) as the ferries and manages to display parallel problems. Similarly the Executive is now chosing to not protect domestic Scottish air fares and services through PSOs (Public Service Obligations), despite the fact that just about every other EC country does this for social or economic reasons (see Scottish Air PSOs). This posted 25th January 2012:Is the Governments ferries policy "economically illiterate"? See here for an answer. This posted 25th February 2011: if you want to understand what is going on and should be going on in terms of the hard economics of ferries in Scotland (and indeed elsewhere) you should read this here. This posted 1st October 2010: see here for an analysis of the folly and waste of RET. the title says it all. This posted 18th July 2010: Some further public interest issues here regarding the government's failures on the question of Operator of Last Resort for Scottish Ferry services following on from yesterday's blog. This posted 27th November 2006: The Executive appears to be seriously considering a scheme that would end most ferry subsidies for the lifeline routes discussed on these pages, after advocacy of such a scheme by George Lyon MSP and Alasdair Morrison MSP. In the Scottish Parliament 26th October, Alasdair Morrison, Western Isles MSP asked the Minister of Transport to give "serious consideration to a ferry discount scheme" based on a "residency criterion that has been used so successfully for the air discount scheme". The Minister responded that he would be "happy to consider" this. Then the Argyll and Bute MSP George Lyon also suggested in the Scotsman 22nd November that the air discount scheme could be extended to ferry services. Problem? EC rules preclude more than one form of intervention to aid any one route. So if you subsidise air (and ferry) island residents using aid of a social character provision from the EC (as in the air discount case), you cannot then use, say, PSOs under the 1992 Martime Cabotage Regulation to subsidise other users on the same routes. Any residents discounts scheme here means you would not be able to subsidise other users (such as tourists, business users, commercial vehicles etc) on the same route. Indeed, if the subsidy base is limited just to passenger travel for those who are island residents (as in the air case), it is arguable that you may not even be able to subsidise carrying of any vehicles at all. In any event, this could reduce the base eligible for subsidy on most lifeline ferry routes to a fraction of what it is at present. But in the absence of a PSO (eg a cap on non-resident fares), not only could you not subsidise this, the other side of not having a PSO cap is the ferry operator would maximise its profits by putting its fares on non-residents sky high - and even this might not be enough to compensate for the lack of subsidy, the tender for the route(s) might still collapse without adequate subsidy on all users, not just the narrow residents base. But of course, the Executive have said they will not be imposing PSOs anyway (see discussion above under "Context", and in panel on right). They may see an "aid of a social character" scheme limited to island residents as the only option they have left themselves. Another shambles? Looks like it. This posted 12th October 2006: The original story on PSOs being necessary for subsidising lifeline ferry services, but the Executive choosing not to impose PSOs, was run in the Herald August 4th, see article and blog for August 4th below. The Herald's original story and line was confirmed this week by the Commission, see blog for 10th October, immediately below here. The Herald decided to run an article on this and scheduled it for the front page for today. However, not only was the story pulled from my hard copy of the Herald today, there is no mention of it anywhere in the paper. Apparently the story is on page 11 of an edition in the Highlands, but in my hard copy that entry is replaced by the opening of a lap dancing chain. If you go through the various menus on the electronic version of the Herald today (news, business etc), there is no mention of the article. If you page in keyword, "Calmac", the article appears. But of course no-one would think to page in the key word unless they knew the article was already there. It appears not under "news" but under the "politics" banner. How does something go from being rated a front page news story to being effectively rated not worth reporting at all, when there is no indication of any substantive new information that should change the story? I have no doubt that the story will out one way or another. But on past experience I expect its impact and point to be neutered and confused by government spin when it does. This posted 10th October 2006: The Commission confirms that subsidy may be granted to operators to cover the costs involved in meeting PSOs (Public Service Obligations) on a route, and that the imposition of public service obligations is therefore a precondition for any subsidy to be given - confirming the points made in previous blogs here below. But the Executive have already stated that "there is no need to consider, nor do we intend to consider, issues arising in relation to PSOs". The implications are discussed in CalMac PSO answer. This posted 6th October 2006: The CalMac Annual Report published today states "the European Directive on maritime cabotage ... provides that State Aid may be paid only to fulfil a Public Service Obligation ..."
Exactly. See also the blog for 4th August below and What is a PSO on this page. The Executive have decided not to apply Public Service Obligations (PSOs) to CalMac routes and services, which effectively renders any subsidy to these services potentially illegal. This must now count as one of the most incompetent decisions in a catalogue of incompetent decisions in this context by the Executive. This posted 5th October 2006: Press release by CalMac on formation of VesCo and splitting up of CalMac. Contrary to the initial BBC report (see blog here for 20th September below) VesCo is not to be located in Gourock, but in Port Glasgow. Tavish Scott: We expect that VesCo will be in existence by the closing date for the submission of proposals for the Gourock - Dunoon service. This posted 21st September 2006: It is rare for an academic putting forward a hypothesis to find support for that hypothesis the very next day. But a senior procurement officer for the Executive has done exactly that. In yesterdays blog I said "some, including me, have been asking how the Gourock-Dunoon tender (see Blog 5 below) could be regarded as a competent tender when the Invitation to Tender clearly states that bidders should demonstrate that they have concluded contingent contracts by end of October with VesCo, an entity which does not exist .... once this glaring flaw was pointed out, there would have been an incentive to rush through the split of Calmac into two, so creating VesCo as a cosmetic exercise with the Gourock-Dunoon route in mind before end of October". 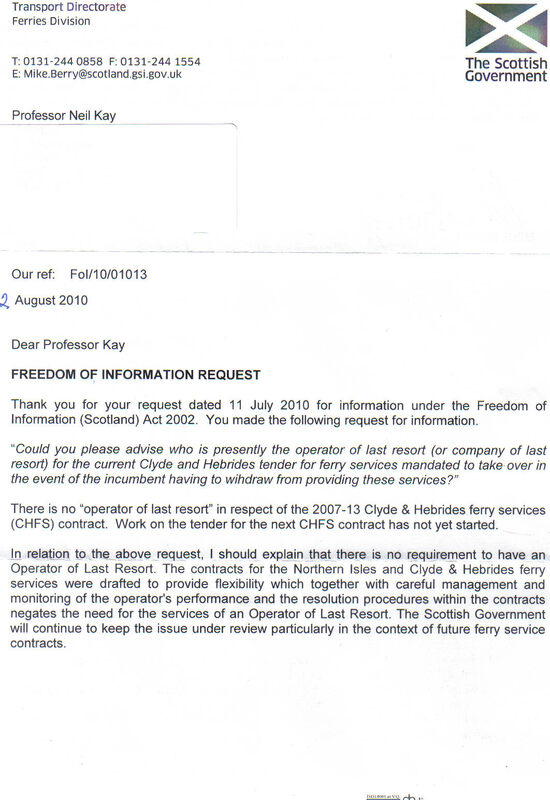 E-mail from Executive today: Professor Kay: Thank you for your e-mail dated 28th August 2006 to my colleague ... concerning the Gourock-Dunoon Invitation to Tender and specifically the concluding of various contingent contracts with VesCo. The Invitation to Tender for the Gourock-Dunoon ferry service made clear that given the restructuring of CalMac into vessel and asset leasing company (VesCo) and operating company (OpsCo) had yet to take place, we were inviting tenderers to direct any questions relating to VesCos involvement in this tendering exercise to the Executive in the first instance. Earlier this week CalMac announced their intention to restructure the company from 1 October 2006. With effect from that date, the business of running the Clyde and Hebrides ferry services will be transferred to CalMac Ferries Limited. The ownership of the vessels and ports will remain with VesCo. VesCo will therefore be in existence by the closing date for the submission of proposals for the Gourock-Dunoon service. Comment: the crucial words there are "VesCo will therefore be in existence by the closing date for the submission of proposals for the Gourock-Dunoon service". In short, by creating as a legal entity the major body that the tenderers were supposed to have been discussing negotiating and concluding contracts with, in the same month (October) that these contracts are supposed to have been concluded, the Executive appear to think that this makes their tender process competent and legitimate. It does not take tenderers, auditors, and competition authorities to critique this, anyone with the slughtest knowledge of what its required to make tenders fair and and open will see this for the patent nonsense and charade that it is. The creation of VesCo in October merely as a legal entity is a purely cosmetic exercise designed to put a facade of respectability on the Gourock-Dunoon tender process, a process that is, for whatever reason, designed to prevent the emergence of any genuine compeition on this route. This posted 20th September 2006: The BBC report that CalMac is to be split into two from beginning of October. A separate Press Release by CalMac confirms that this is indeed the VesCo / OpsCo split planned for tendering purposes with Caledonian MacBrayne Ltd as VesCo the asset owning company, and CalMac Ferries Ltd as the present OpsCo or operating company. The original BBC report also says that the asset owning company will "will retain actual ownership of ferries and remain based at Gourock in Inverclyde". NOTE the later BBC report was changed from the original version and drops any mention of where VesCo will be located. Why? because "VesCo should not be co-located with OpsCo, especially during any tendering process in which OpsCo will be involved" (Stage 1 report para 23). The Executive stated "The new ferry operating company (OpsCo) will continue to be based at CalMac's Gourock headquarters". The reasons for separate geographic location of VesCo away from Gourock and OpsCo was to reduce the chances of OpsCo having an unfair advantage over other tenderers in any tender process if there was co-location (or even proximate location). In the absence of information to the contrary, it must be assumed that the management of both VesCo and OpsCo will be co-located in Gourock (contrary to the principles underlying the Stage 1 Report), at least for the moment, quite possibly both at or near the current headquarters and for the last month of the Gourock-Dunoon tender. Which raises questions that the Stage 1 Report had sought to resolve. And there is also the question of why this apparently sudden rush to separate into VesCo and OpsCo in October 2006 when VesCo has been mooted for about six years. What has happened in the last few weeks is that some, including me, have been asking how the Gourock-Dunoon tender (see Blog 5 below) could be regarded as a competent tender when the Invitation to Tender clearly states that bidders should demonstrate that they have concluded contingent contracts by end of October with VesCo, an entity which does not exist. The Executive have opened themselves up to the criticism that they never bothered about this aspect of the contract because they never expected there to be any serious bidders in the first place (a criticism which I make in Blog 5 below). However, once this glaring flaw was pointed out, there would have been an incentive to rush through the split of Calmac into two, so creating VesCo as a cosmetic exercise with the Gourock-Dunoon route in mind before end of October. Questions like appointments to the Board and eventual location of VesCo (if it is to be separated from Gourock) are likely to be fudged at this point. In fairness, there may be other rational reasons for the form and the coincidence of timing of this decision, but it is difficult to see what they would be. Will this split of VesCo and OpsCo work? Almost certainly no. As has been seen time and again with the Executive's tendering of lifeline ferries, their short term fixes just lead to more problems. Apart from the dangers of being open to accusations of compromising the integrity of any tender process by co-locating VesCo and OpsCo in Gourock (as implied in the original BBC report), there would have been, and will be, no chance of coherent and credible discussions between VesCo and bidders before end of October about use of assets for the Gourock-Dunoon tender. The original schedule for tendering of CalMac (which has slipped several years and which included the formation of VesCo) states there would be an expected lag of at least six months between Vesco Board appointments being advertised and "VesCo bedded in and able to deal with enquiries from bidders". Not only would there appear to be no six month lag between the appointment of VesCo Board members and being able to deal with bidders queries for any tender here, the latest publicly available information (Item 3) I have (March 2006) is that "there was no move yet with regard to Board appointments for VesCo". In any case, hardly time for any party that would have been interested in the Gourock-Dunoon tender to discuss, negotiate and conclude contingent contracts for various assets with VesCo. What the Executive appear to have done is open themselves up to potential complaints that they have further compromised the integrity of at least the Gourock-Dunoon tender. I have argued to Parliament and the Executive that it was possible to comply with EC rules without tendering CalMac and Gourock-Dunoon, but if you do decide to tender, you must do it properly, otherwise you are threatening these lifeline services that you are mandated to protect. It looks like this shambles has just got much worse. This posted 11th September 2006: Short summary of concerns over the four tenders sent to the Minister here. This posted 20th August: the proposals for a ferry service at Ardyne Point are being resurrected, the implications for Bute and Cowal residents are set out here. Also, the issue of the dangers of the Executive not having thought through the question of Operator of Last Resort is highlighted by the parallel case of what is happening in rail, see here. This posted 15th July 2006: Not only is the Executive failing to pursue PSOs for ferry services (see Tender 2 for 7th July 2006 below), they are failing to pursue PSOs for Scottish air services. See column on right for "Scottish Air PSOs". This posted 8th July 2006: I have come across a piece of evidence which could be invaluable here. I had always thought thought it would be easier if Norway had to comply with EC State Aid and Maritime Cabotage law given the importance and similarity of island and fjord ferry transportation to them just as in Scotland. In fact, they have to. As members of the EEA as EFTA members, the basic EC rules here apply to them as well. The EFTA Suveillance Authority Decision of 2004 shows how EC Maritime Cabotage, State aid law, PSOs and the Altmark case can all be of relevance in a geographically similar economy to the Scottish context. Note (a) the central role of PSOs (not just tenders and PSCs) in determining subsidy (b) the relevance of Altmark and the setting of PSOs - which I argued last year in my alternative proposal, but which was dismissed by the Executive (c) the importance of setting PSOs at indivdual route level, not at the level of bundled routes. This posted 11th June 2006: In a maritime tender related under EC competition and state aid rules to the other four discussed here, Scotland on Sunday report that Scottish ministers are facing court action by an English shipbuilding firm, Appledore, over claims they sabotaged a £10m construction deal to protect a Scots-based company. The paper notes that even if ministers are shown to have done nothing wrong, taxpayers may now be forced to pay the costs incurred by Appledore in preparing the bid, understood to run "well into six figures". The paper also notes the row over the contract now means that the tender for the new vessel has been put on ice, potentially for up to a year. See also the posting for 3rd June below. Just add this fiasco to the long list of shambles over the other four tenders listed in the pages here. It is difficult to think of how the Executive could have found more ways to mishandle maritime tenders and the public interest if they had tried. This posted 3rd June 2006: The Glasgow Herald had reported earlier (May 26) that the Executive has halted its tendering process for a £5 million fisheries protection patrol ship because of concerns that European Union competition rules had been broken. The Minster responsible said: "I am unable to say when a new tender process will begin". In view of the fact that the Executive has had major difficulty in both understanding, following, and listening to advice on European competition rules in the case of the other maritime tenders discussed in these pages, this news may be seen as about par for the course. In the Herald article David Davidson, Conservative transport spokesman, said: "This debacle underlines the executive's utter incompetence when it comes to anything to do with maritime tendering." This posted 10th January 2006: The Scotsman reported that fears were raised today in the Audit Committee of the Scottish Parliament that ferry operators could attempt to cherrypick the best routes from Scotland's lifeline services. The answer is that they could, that the Executive could stop this, that the European Commisson recognises that there are legitimate ways that governments could deal with this, that the Executive have not put in place mechanisms to stop cherrypicking, and that I warned about this in my original submission to the consultation process on the proposed CalMac tendering process in March 2005 (see the column on the right on this page here for more on cherrypicking). This posted 6th January 2006: I finally received (delayed by Xmas mail and office closures over the period), this Reply from the Executive to my Comments letter to the Minister referred to above. I leave to others to judge to what extent it suggests that the detailed points made in my letter are being considered seriously. This posted end December 2005: Argyll and Bute Council is said to be planning significant increases in pier dues. If this is confirmed, it could lead to higher fares for users or increased subsidy burden on the taxpayer. In the case of the Campbeltown-Ballycastle and Gourock-Dunoon tenders, even just the threat and associated uncertainty of being held hostage to such new burdens could be the final straw that deters any remaining operator interest in these tenders. Clearly the council must publicly clarify its position on this at the earliest opportunity. This posted end December 2005: 19th December 2005, the European Commission announced in a press release that it was referring Greece and Portugal to the European Court of Justice for alleged breaches of EC Maritime Cabotage law involving island shipping services. The significance for Scottish ferries and the Executive is that the Commission is becoming more pro-active and aggressive in taking action under this legislation. This posted 11th September 2006: Short summary of concerns based on the Ministers comments and noted in my post immediately below sent to the Minister, copy here. This posted 8th September 2006: The Minister of Transport Tavish Scott said in the Herald today (page 11) "We have an extremely robust tendering process. V ships did not win the Northern Isles ferry contract because their bid would have cost the taxpayer tens of millions of pounds more than the winning bid." I predict that the Calmac bid will turn out to be gross underestimate of the necessary subsidy once the contract is up and running, just as it was in case of the first Northern Isles first tender which collapsed and in which CalMac was a partner. It may even turn out to be more expensive in the end than the losing V Ships bid. Why? Because the penalties from underestimating the risks and necessary subsidy in the case of a Calmac bid can simply be simply passed on to the taxpayer in the end of the day, while the costs and underestimating of risks and necessary subsidy in the case of a bid from V Ships would first of all be borne by shareholders who would then wreak vengeance directly on the management responsible. In the absence of an independent regulator assessing bids, there is no more reason to place faith in Scottish Executive's treatment of their own company's bid than there was the first time around when Northern Isles was first tendered - and about which I warned in evidence to the Scottish Parliament in September 2001. This posted 4th August 2006: As reported above "Recent Developments of General Relevance", the Herald Newpaper today confirms that PSOs are needed to subsidise lifeline ferry services. The text of the article is here with possible implications for Northern Isles. This posted 7th July 2006: The new ferry contract for the Northern Isles route has just been announced in a Scottish Executive Press Release and has been awarded to Northlink Ferries, a company formed by Caledonian Macbrayne. The budgeted subsidy for the first year of operation is £31 million (subject to adjustments in the light of actual inflation and other factors....). Those interested (the taxpayer should be) should compare the subsidy now with previous years, including when P&O and then Northlink ran the service. P&Os subsidy over the last four years it ran the service (1999-2002) was about £11mill a year. This posted 23rd March 2006: One of the (many) mysteries of these tenders is where and why the trigger point of £750,000 came from (see post for beginning January below). The Executive say they will consider paying additional subsidies to the new Northern Isles operator in "certain circumstances" and will only consider paying additional subsidy if the operator's losses exceed £750,000 in any one year. This is of course probably completely coincidental, but Northlink (CalMac plus Royal Bank of Scotland) have just posted a loss of £696,000 on the route, see Herald, and of course CalMac has been recently announced as preferred bidder for the route (see post for 19th March). It is lucky that the trigger point had not been set at, say, £650,000, otherwise the Executive would have been in the embarassing position of potentially having to bail out its preferred bidder (as part of the Northlink joint venture) again before the contract even started, this being potentially doubly embarassing because CalMac is of course the Executive's own company. So heck, what does it matter, it is still the taxpayer who finishes up picking up the tab anyway, one way or another. This posted 19th March 2006: CalMac has been chosen as preferred bidder for the Northern Isles tender, see here. While this is the least-worst alternative compared to any private firm being awarded this lifeline route given the absence of proper checks and balances (the absence of which I have been pointing out to the Executive and successive Transport Committees of the Scottish Parliament for six years), the real question is why there was so little commercial operator interest in the route in the end. One part of the answer is that the Executive's weak and totally adequate approach to these issues means that profit in Scottish ferry services will not lie in running tied and restricted PSO tenders, but in cherrypicking parts of the route and ruining the business plans of the PSO tender itself (see panel on cherypicking on right). That is why many firms are standing back from this process at the moment. Once these tenders are place and the "winning" tender bidder tied down and committed, these cherrypickers will be able to select their targets and over the years the public service routes will be attacked at will, the losers will be the public service, integrated transport, users, communities, and especially the taxpayer who will be left with the bits that the cherrypickers spit out. This posted 21st January 2006: the Shetland News reported that the retender was being delayed by a month "to give the Scottish Executive more time to ensure a smooth handover". It was also reported that NorthLink have now received £78 million in government subsidy for the ferry service they started to operate in October 2002, more than twice what was agreed in the initial contract. This posted end December 2005: At the end of November, it was reported that the present operator Northlink (a CalMac and Royal Bank of Scotland joint venture) was under investigation by the OFT for what the OFT said were "reasonable grounds" that it had breached the Competition Act. The Auditor's report into the Northern Isles fiasco also found that about double the agreed public subsidy had been spent over three years in keeping the tender going. A BBC report into the forced retendering noted that the Executive had said they had learned the lessons advised by the auditor from the original tender, such as the need to provide the bidders with adequate information. But a Scotsman article just a few weeks earlier had suggested that two of the three companies shortlised for the new retendering process were still disasatified with the information they were getting to help frame a tender bid, so little evidence that lessons had been learned. ICG has pulled out, leaving just CalMac and V-ships in the running for the tender. The Auditors report into the original Northern Isles tender described the tender process as "adequate". That may be the view from an accountant's perspective, but regulatory economists and professional regulators would likely take a very different view if asked their opinion on this debacle. This posted 22nd April 2008: The former Minister who was reponsible for pushing the CalMac tender now says the Commission is to blame for all this debacle. See my comments on that here. This posted 8th March 2007: The Scotman says today: "Tavish Scott, the transport minister, said ministers could not break the law by defying the European Commission directive, which required them to put CalMac's routes out to competitive tender ..... We were presented with no alternative but to tender in order to ensure that the subsidy was in line with European law. "Ministers are not allowed to break the law," he said. "That doesn't mean I like the laws." (a) a European Union directive is a device requiring member states to achieve a particular result without dictating the means of achieving that result. If it had been a directive here it would not have specified means (such as tender) for achieving a speciifed result. (b) In fact, it was not even a directive that was the issue here, it was a Regulation (the 1992 Maritime Cabotage Regulation), quite a different legal devce. And has been made abundanlty clear, even that legal device does not specify any need to tender. (c) There would have been no need to tender if the Executive had been prepared to frame an Altmark-compliant proposal. When he says "we were presented with no alternative", he has it the wrong way round. It is not the Commission's job to present alternatives, it is the member state's responsibility. You do not ask the umpire to formulate your strategy for you, whether the game is football or State aid. This posted 2nd March 2007: The Bute Ferry Users Group has podced an excellent website and analysis of the implications of the CalMac tender for Bute. I produced this Note on the implcations of the tender for Bute and the network in general partly in reponse to their work. This posted 18th February 2007: The comment in the blog for 16th February below is published as a letter in the Herald 17th February. This posted 16th February 2007: The Herald carries an article revealing that "The Scottish Executive has been sidelined by Whitehall bureaucrats in a bid to have (the CalMac) controversial and costly tendering process for lifeline ferry services scrapped", the editorial notes "Shambles? Fiasco? Neither is too strong a term" and my comment here argues that this explains why it was right to raise the question of the blog of 31st January immediately below - there was no need to tender these services. This posted 30th January 2007: "The Executive's attempt to open up the Western Isles ferry routes to tender was in tatters last night after V.Ships, the last private sector bidder, pulled out, claiming the process was flawed", see here and blogs for March and June last year below which predicted this. This posted 12th January 2007: The Commission has replied to a question from Alyn Smith MEP on the Executive's failure to apply PSOs on the CalMac services. The answer is discussed here, confirms worst fears and adds more. This posted 14th December 2006: The Executive has released more details on the proposed tender. The proposed improvements to the services are to be commended in themselves but for the most part they are marginal. It seems the improvements were based on the Executive's interpretation of the results of ad hoc consultations. This is simply not adequate under EC law. "Consultations" are useful to signpost possible areas of improvements but if you are to provide subsidised services (and it is to be assumed these will be subsidised services) you have to be prepared to justify these to Brussels as promoting economic and social objectives under PSOs (public service obligations). Brussels simply will not accept a justification for subsidised services that "it was what the residents said they would like to have". However, the Executive have said they are not going to use PSOs to justify subsidy for CalMac services. Apart from raising the question of legality under EC law (see elsewhere on these pages here), not using PSOs means there is no basis for assessing and justifying proposals that could actually enhance the economic potential of these islands. To take one example, measures and PSOs to improve access and rates for Mull businesses on the ferry could do a lot more to stimulate the local economy than an extra sailing on a friday night. A real missed opportunity. The bids (or bid) are due to be submitted the week after the May 2007 Holyrood election. This posted 12th October 2006: The Herald has article on Commission's reply (see also 10th October below) on PSOs being necessary for subsidy for CalMac (but see also Blog 1 above for 12th October on this). This posted 10th October 2006: The Commission confirms that subsidy may be granted to operators to cover the costs of meeting PSOs (Public Service Obligations) on a route, and that the imposition of public service obligations is therefore a precondition for any subsidy to be given - confirming the points made in previous blogs on this page. But the Executive have already stated that "there is no need to consider, nor do we intend to consider, issues arising in relation to PSOs". The implications are discussed in CalMac PSO answer. This posted 20th September 2006: See Blog 1 above (for 20th September) for news on formation of VesCo and some implications for CalMac tender. This posted 4th August 2006: As reported above "Recent Developments of General Relevance", the Herald Newpaper today confirms that PSOs are needed to subsidise lifeline ferry services. The text of the article is here with possible implications for CalMac tender. This posted 7th July 2006: The Minister Tavish Scott now has announced that he intends to run all CalMac services wiithout any Public Service Obligation (PSO) on any of the routes. Since a clear declaration of relevant PSOs is generally seen in EC law as prerequsite for subsidising lifeline ferry services, this has major implications. I have spelt out the possible problems and implications in a letter and note to the Minister, copied to members of the Local Government and Transport Committee of the Scottish Parliament. This posted 5th June 2006: As predicted, (see posting for 19th March 2006 below) the signs are now that V-Ships will pull out of the tender process for the CalMac network leaving just CalMac the sole firm left in the bidding process. Why are we not surprised? See Scotsman 3rd June and the discusssion below in th rest of this section on this tender. This posted 19th March 2006: The fact that V-Ships did not win the Northern Isles tender (see above) must increase the chances of CalMac winning the tender for its own network since the CalMac tender would have been much more attractive to V-Ships for administrative and other reasons if they had already won the Northern Isles tender as well. While CalMac winning the tender for its own network must be counted the least-worst alternative compared to any private firm being awarded this lifeline route given the absence of proper checks and balances (the absence of which, as I noted under Tender 1 above, I have been pointing out to the Executive and successive Transport Committees of the Scottish Parliament for six years), the real question is why there is already so little commercial operator interest remaining in this tender. As I noted under Tender 1 and repeat here, one part of the answer is that the Executive's weak and totally adequate approach to these issues means that profit in Scottish ferry services will not lie in running tied and restricted PSO tenders, but in cherrypicking parts of the route and ruining the business plans of the PSO tender itself (see panel in the column on the right on cherrypicking). That is why many firms are standing back from this process at the moment. Once the CalMac tender is in place and the "winning" tender bidder tied down and committed, these cherrypickers will be able to select their targets and over the years CalMac's public service routes will be attacked at will, the losers will be the public service, integrated transport, users, communities, and especially the taxpayer who will be left with the bits of the CalMac network that the cherrypickers spit out. This posted end December 2005: BBC Scotland reported that CalMac was transfering its ship crewing operations to Guernsay to save £1mill a year in national insurance contributions. According to another earlier BBC report, the contest for the CalMac tender has narrowed to three companies; CalMac, V-Ships and Western Ferries, down from seven companies expressing interest in another BBC report in November. Comment: clearly experience, capabilities and management resources relevant to the running of what is a major ocean going ferry network and lifeline service should be a prerequisite for the award of the tender, which means the contest is now effectively a two-horse race, paralleling what is happening on the Northern Isles tender. The draft Invitation to Tender for the CalMac network is here. In 2001, the Transport and Environment Committee of the Scottish Parliament considered the issue of the proposed tendering of CalMac services on Feb 28, on May 30, on June 12, on June 18 (this meeting including written submitted evidence from Professor Tony Prosser, Captain Sandy Ferguson and me) on June 26 (with a further submission from me) and on Sep 26 (which includes the report of the Committee's Inquiry into this issue). The evidence I gave to this committee in 2001 and the warnings I raised as still as relevant today as they were then. In 2005, its successor committee, Local Government and Transport revisited the same issue on 22 Feb, on 8 March, on 15 March, (includes papers by Paul Bennett, Edinburgh University; Jeanette Findlay, Glasgow Uiniversity; and my Europa Institute paper) on 12 April, on 24 May (with evidence from Paul Bennett and me), on 31 May (with evidence from Jeanette Findlay) on 21 June and 13 Sep (with evidence from the Minister Tavish Scott). Again, more on the background problems, likely outcomes and a feasible solution for this and the other tenders in my Comments letter. This posted 13th October 2006: Yesterday's report confirmed, the Department of Enterprise, Trade and Investment (DETI) in Northern Ireland yesterday issued a statement abandoning the Campbeltown-Ballycastle initiative, this reported in the Herald . This posted 12th October 2006: Reports coming in that Northern Ireland Office have withdrawn from the Campbeltown-Ballycastle tender. If confirmed this will be further confirmation that the Executive's policy here a complete failure, as predicted in my earlier blogs (see below). The NI commitment was capped at £300,000 subsidy, the Executive's at £700,000 so if the Irish thought the game was not worth going on with even given their limited exposure, then it speaks volumes about the Executive's flawed approach. This posted 3rd June 2006: The website of the Campbeltown Courier as of today still shows on the front page the headline from 1st April "Here We Go Again" and notes "For the umpteenth time, the message from the Scottish Executive regarding the proposed Campbeltown to Ballycastle ferry service seems to be 'not this year, maybe next'". As I have noted last year and this year (see post for January 12th below), there is a very good chance Campbeltown will have to wait a very long time. The key question is why the Executive is keeping what are almost certainly false hopes alive when they have produced no new plans to deal with the (predicted) failure to secure the service last year. This posted 19th March 2006: The Executive have announced (see here) that they are still interested in seeking a bidder for this roure even though they did not get any through the formal prcess (see below). They say "investigations will require time to pursue and it is not possible to place a precise timescale on them in advance, but every effort will be made to establish the position as soon as practicable". This is making and pursuing policy by wishing and hoping, crossed fingers, hoping something (they don't know what ...) will turn up, when they have already been told why their present policy was unlikely to create a sustainable service, and instead how a pro-active policy could work in this context. Another shambles. This posted January 21st 2006: there are reports that at least two companies have expressed interest in running a service on the route even though the tender deadline has passed, in one case it would be a fast passenger-only service. I am going to reserve comment on these proposals, partly because details so far are sketchy, but also because I do not want to say anything that could be seen as prejudial to any proposals for the route. In any case, my views are adequately enough set out elsewhere on these pages. This posted January 12th 2006: A BBC Report confirms that there were no bidders for the tender by the deadline set for today. It will be noted that I wrote to the Minister last year in my Comments letter about all four tenders, and in the case of Campbeltown-Ballycastle said; "It is not clear how you can produce a short list for the Cambeltown-Ballycastle service when it is not clear where the vessel(s) will come from .... There is little, if any, evidence that the short-listed companies have such plans or are in a position to develop them..... The bottom line here is that there is little chance that the shortlisted companies have credible plans for a service on the route, and little chance that they can develop credible plans". In the Reply from the Executive to my letter, the Executive made no reference to my comments on Campbeltown-Ballycastle. It will be noted that my view on the likely outcome of the tender had conflicted with that of the Minister who said in the BBC report of the tender failure this week that; "We reported in September that we had received an encouraging level of initial interest in the route, and that we hoped this would lead to a compliant bid being received"
In my Comments letter to the Minister I suggested what could and should be done here and my Note of 12th January presents a way forward both for this route and Gourock-Dunoon. The original draft Invitation to Tender is here, the current Executive announcement intending to tender is here, and the announcement of the shortlist is here. Again, more on the background problems, likely outcomes and a feasible solution for this and the other tenders in my Comments letter. This posted 7th October 2011: Today I received a public apology in the current edition from the Dunoon Observer confirming that offensive comments about me made by the local constituency MSP Michael Russell in connection with the Dunoon ferries were unwarranted and not based on evidence. My letter today and the paper's apology is here. I will be asking Michael Russell to also withdraw his comments and apologise in light of the paper's actions. This posted 26th August 2011: The first real test for the new ferry service will be Cowal Games tomorrow, see here about this . This posted 28th May 2011: This follow up to the posting below on 25th May (and should be read after it) helps explain why the Government still tried to get the June 30th deadline for the start of the tender extended - even though the existing deadline had already given them enough time to conceal the passenger-only future for Gourock-Dunoon until after the election. This posted 1st July 2010: An error or anotther scandal? Is the Government trying to bury evidence on the Gourock-Dunoon route that has the potential to severely embarrass it? See here. This posted 21st August 2009: See analysis here and implications of "Western Ferries and the replacement linkspans that weren't"
This posted 22nd July 2008: Various pointers to the imminent end of the town centre to town centre vehicle ferry service. See here for more. This posted 10th December 2007: I have received this letter by email from the Leader of Argyll and Bute Council on the documents I received under FOI on the so-called "Users Charter" meetings (se blogs below for 14th September and 13th October). Here is my response. The documents in question received under Freedom of Information are here. This posted 6th July 2007: The Managing Director of Western Ferries claims in the Dunoon Observer today, "Western Ferries has never sought a monopoly" on Gourock-Dunoon. Here is my comment. This posted 15th March 2007: The final push on what remains of the CalMac (Cowal Ferries?) vehicle-carrying service has started. If you go today to buy adult and/or child 10-journey passenger tickets from the local agency in Dunoon at the bucket shop prices, you will find they have just been given modest rises of about 2-3%. By contrast, 10-journey tickets for cars have gone up from £39.50 to £45, a 14% rise. As with everything else that has been happening on this route recently, there was no warning, no consultation. This will be clearly be the last straw for those vehicle-drivers (now rapidly dwindling in number) who have stayed loyal to CalMac and many of whom will now switch to Western. And guess what? After the election an announcement will be made that vehicle-carrying on the Gourock-Dunoon route is no longer commercially viable or acceptable, with the commercial service provided by Western by then carrying (probably) over 90% of vehicle traffic. But why now? Would it not probably be more politically astute to leave this transparently obvious tactic until after the election in a few weeks? My best guess is that something like this has been planned for months (as we now know, so also was setting up Cowal Ferries) and that all this is being ultimately driven by the same people who were deeply involved in the private User Charter Meetings with Western Ferries, that is the Scottish Executive officials (remember the existence of these meetings was only revealed because of questions asked under FOI legislation). The officials may not have specified exactly the 14% rise, but they would certainly would not have hesitated to help push it in that direction as a further step in the eventual wholescale unregulated privatisation of lifeline vehicle-carrying services on this route, something they and their predecessors have aspired to for years. Anyone who think they would not micromanage to this extent probably does not realise that there is a civil servant present at all CalMac board meetings. The civil servants do not know who is going to be the Minister of Transport after May, but they are going to make as sure as they possibly can that the new Minister will be presented with an offer they can't refuse; that is, passenger-only Gourock-Dunoon with Western being given the vehicle-carrying monopoly. That was how ferry and air PSOs disappeared off the agenda completely when a new coalition (and new Minister of Transport) took over in May 2003. That is what is behind "Cowal Ferries Ltd" and 14% fare rises for cars. They are setting things up so that so that the new Minister will be hogtied over this as Calmac itself has been. But while to be forewarned may be to be forearmed in most contexts, it does not seem have made much difference to Cowal in the past, especially with what is at stake and the powerful influences that are driving this whole thing. This posted 17th December 2007 Reports and editorial comment (Dunoon Observer) on the public meeting on the future of the Gourock-Dunoon ferries here. (posted 11th December) A public meeting was held on the future of the Gourock-Dunoon ferries December 8th. Reports on this expected in the Dunoon Observer later this week. This posted 3rd December 2006: Have added comments on options for Gourock-Dunoon here. This posted 26th November 2006: A profile of Mr Gordon Ross of Western Ferries and four letters on the Gourock-Dunoon farce in the Herald Saturday. The Herald is to be commended for its coverage of the issue this week (though its habit of later archiving material and asking readers to pay for access is less helpful). This posted 18th November 2006: Excellent feature article on the Gourock-Dunoon shambles in the Herald newspaper today. What Cowal saw last week was the flying of a kite by CalMac when they issued a press release saying their service "could" go entirely passenger-only because of a possible 13 ton weight restriction on the pier by the council - despite the fact, as the council stated, 95% of traffic would be unaffected by the restriction. They would have seen the response to their kite on BBC TV prime time news last week when a local businessman stated, it was all "the council's responsibility" and "no fault of Caledonian MacBrayne". So now that Calmac have flown that kite, and found the wind very much to their liking, the next time (and it will be very soon) it will not be a kite that will be flown - the CalMac service will go passenger-only. And you can forget about the new vessel for Bute being deployed on the run, even though it will be available, and there are no credible techical reasons why it could not be deployed (as Captain Sandy Ferguson, who used to run CalMac's operations, has confirmed). Do you think the Executive/CalMac (same thing) will give the residents of Cowal a tantalising glimpse of the luxury that their counterparts on Bute are being treated to when plans have been drawn up to make the Ali Cat (or equivalent) the model for their 21st Century transport futures? This posted 22nd October 2006: The Dunoon Observer 20th October carries a series of entries documenting what is happening here, including the editorial which calls me "something of a modern Cassandra", which I think is a compliment though the picture of Cassanadra in Wikipedia does not really flatter me. Statement (1) The Executive says "The discussions with Western Ferries in 2004 on a possible Users' Charter were not predicated on Western being the sole provider of ferry services". Statement (2) The Executive says; "The issue was raised by Western Ferries at the final meeting in November 2004 and the executive made it clear such an outcome should not be assumed as it would depend on future tendering exercises". Fact: November 2004 was not the final meeting, and correspondence and meetings on the issue continued after the December 8th 2004 to put the route out to competitive tender, at least well into 2005, as confirmed in the FOI documents. There was at least one other meeting between Western Ferries and the current Minister Tavish Scott in September 2005 on the issue. 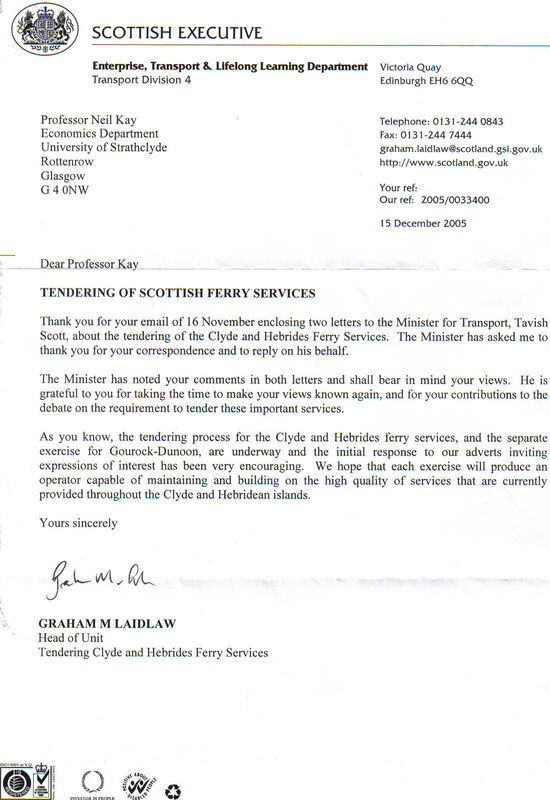 The FOI documents also note that in January 2005, a senior Executive official wrote to Western Ferries. "the Scottish Executive see a number of merits in the Users Charter proposed by Western Ferries. The Executive, along with representatives of Argyll and Bute Council, provided a number of comments on the proposal at the 9 November meeting. If, following consideration of these comments, Western Ferries would like to forward an updated draft then the Executive would certainly be prepared to consider further. It will be noted that the Executive official is referring to the November 9th 2004 meeting as the basis for further development of the proposal, not the subsequent and intervening December 8th 2004 announcement of putting the route out to competitive tender. Indeed, there is no mention of the December 8th announcement in the letter, it is as if it never existed. It was in fact the 9th November meeting where Western emphasised that their discussion of the Users Charter was predicated on their being sole provider of vehicle carrying services and Executive "accepted (Westerns) view" on this. Statement (3) "Any suggestion the executive has been colluding with Western Ferries to make it the sole provider is wrong." Fact: the only mention or suggestion here of possible collusion has been by the Executive. However since they see that inference as possibly being a reasonable interpretation of the facts that have been made public to date, then the only ways that this possible intepretation can be refuted or otherwise clarified is by full disclosure by the Executive of what was discussed and decided (even if only on a contingent basis) at these meetings, or an investigation by the appropriate antitrust authorities at UK or European level. This posted 17th October 2006: We now know through Freedom of Information that there were at least six meetings between the Scottish Executive and Western Ferries to discuss Western's proposals for a "Users Charter" (an Executive/Western agreement setting Western prices and services), and that at least two meetings involved the past and present Transport Ministers, Nicol Stephen and Tavish Scott. The current minister Tavish Scott told Parliament this January; "Discussions on this issue ... were overtaken by the Executives proposals to seek an operator willing to provide a service between Gourock Pier and Dunoon Pier on a commercial basis". However, these Executive proposals were approved by Parliament in December 2004, but details revealed under Freedom of Information have since confirmed that the Executive continued to encourage Western Ferries to discuss their "Users Charter" proposals with the Executive and there was at least one meeting between the minister Tavish Scott and Western Ferries some months after that. Despite heavy Executive censorship of what was discussed and agreed, we know Western Ferries made it absolutely clear in these meetings that their "Users Charter" depended on their being the monopoly operator of vehicle ferries Gourock-Dunoon, and the Scottish Executive stated they accepted that. So any discussion of "Users Charter" implied two conditions - CalMac withdrawing their vehicle-carrying ferries, and no other operators of vehicle services coming into the Gourock-Dunoon market. These discussions about how a possible Western monopoly would work took place in private at a time when the Executive's public position was they were taking steps to encourage competition on the route. Many of the ten operators who first expressed interest in coming into the Gourock-Dunoon market have since expressed frustration with what appeared to be impediments put in their way by the Executive. Recently, V-Ships withdrew from the short list for the tender stating they were "unable to convince our shareholders with sufficient confidence that we could compete on a level playing field" Western is now building second linkspans at both Hunters Quay and McInroys Point that will allow them to run twin-track service on that route and handle all the vehicle-carrying traffic. And now CalMac have announced that they may go passenger-only on what, on close examination, seems little more than a pretext. And once CalMac goes passenger-only for several months, you will not see CalMac vehicle-carrying returning. The Ali Cat (or equivalent) is what is going to be left. Over the past few months CalMac have repeatedly stated that they are only obligated to run a passenger service Gourock-Dunoon, and that obligation is only for an hourly service. If lucky, there might be two Ali Cats. Now, of course, all these subsequent events could be coincidental and have nothing to do with the series of meetings and correspondence involving the Executive about how a Western monopoly could work. It may simply be that the Executive is just guilty of stupidity and naiviety in this context. There is only way that the Executive can prove that their intentions were honourable here and that is to publish everything that was discussed at these "Users Charter" meetings. Because if the information already released raises legitimate concerns about the public interest not being served by the Executive here, there will be no surprise if legitimate concerns are raised regarding the Executive's motives for censorship of even more details of what they discussed and agreed in this context. This posted 13th October 2006: The Herald carries report of yesterday's announcement. This posted 12th October 2006: CalMac has today announced that the Gourock to Dunoon service could be operated as a passenger-only service, following Argyll and Bute Councils decision to place a weight restriction on Dunoon pier from November 1st. The announcement says it could be up to four months but this would effectively be the end of vehicle-carrying, its present vehicle-users would simply switch to Western Ferries. The service is already so restricted at the moment in order to favour Western, there would be just about nothing left to pick up if and when vehicle-carrying resumed.The service is being run into the ground. In any case the working life of the pier is set to expire next year and the Executive will not give the go ahead to build new vessels that will be suited for the new linkspan at Dunoon breakwater. The council's announcement stated that their weight restriction of 13 tonnes will be put in place from 1 November means that over 95% of the traffic which uses the pier daily will not be affected by the works. So why go passenger-only on that basis? The situation that Calmac Gourock-Dunoon will probably go passenger-only is not unexpected. There were six meetings in 2004 and 2005 between the Executive and Western Ferries to discuss Western's "Users Charter". These meetings took place at times when the Executive's public position was that they were actively encouraging competition on the route. The existence of these meetings and their (heavily censored) content was only discovered through Freedom of Information. That is what was being discussed by the Executive and Western behind closed doors, that is why Western has the confidence to build second linkspans at both its terminals in the middle of a farce of an Executive tender for the CalMac service that is designed to get no bidders, and that is why the announcement at this time of Gourock-Dunoon probably going passenger-only should be absolutely no surprise to anyone. This posted 20th September 2006: See Blog 1 above (for 20th September) for news on formation of VesCo and implications for Gourock-Dunoon as well as main CalMac tender. This posted 8th September 2006: V Ships have today issued a statement announcing they are pulling out of the Gourock-Dunoon tender stating "we are unable to convince our shareholders with sufficient confidence that we could compete on a level playing field within acceptable commercial parameters". The BBC coverage is here. This confirms my earlier prediction that they would not bid for it, as well as further evidence that this whole process is designed to not produce any bidder and that it will instead help set up Western Ferries as monopoly operator of vehicle carrying services here. Western yesterday announced a £4mill investment in their parallel facilities on the route. A BBC item says "Opposition parties have raised doubts about the tendering process. They said the Western Ferries move was an indication that confidence in the process was collapsing". Yes, except reading my earlier posts below will confirm there was no reason to have any confidence in this process to begin with. The same BBC item also said "Scottish National Party spokesman Jim Mather said he has raised concerns over the competence and integrity of the tendering process Conservative spokesman David Davidson said several potential bidders had complained to him about its handling". Put that together with V Ships statement today and my posts below and the argument for an independent investigation of this sorry mess is overwhelming. This posted 25th August 2006: The Invitation to Tender for the CalMac Gourock-Dunoon service outlines at several points that bidders should demonstrate that they have concluded various contracts with "VesCo" before submitting their bids by the end of October. Only problem? VesCo does not exist. More on the surreal world of Scottish Executive tendering here. This posted 4th August 2006: As reported above "Recent Developments of General Relevance", the Herald Newpaper today confirms that PSOs are needed to subsidise lifeline ferry services. The text of the article is here with possible implications for the Calmac Network and Gourock-Dunoon. This posted 4th August 2006: The Dunoon Observer reports today (scroll down the papers website for "news" for 4th August if necessary) that three companies are in line for the Gourock-Dunoon tender. They also print a letter from me that descibes this exercise as "drawn out, expensive, futile and wasteful"
This posted 14th July 2006: The Minister and local constituency MSP continues to refer in letter to the Dunoon Observer to "the Kay proposals" even though his attempt to shed Executive responsibility for this debacle has been comprehensively refuted (see postings for this tender 19th and 24th March below). The Editorial in the same edition sytematically refutes this and other allegations. How many times do we have to give the lie to these claims? This posted 7th July 2006: As noted under Tender 2, the Minister Tavish Scott now has announced that he intends to run all CalMac services wiithout any Public Service Obligation (PSO) on any of the routes, including Gourock-Dunoon. I have spelt out the possible problems and implications in a letter and note to the Minister. This posted 3rd June 2006: The Dunoon Observer for 2nd June reports an inspection of Dunoon Pier has revealed that, unless remedial action is taken before the onset of winter, the vehicular access on and off the pier will no longer be able to cope with heavy vehicles. The leader of the council has written to write a letter to the Scottish Executive asking for CalMac to allocate a vessel to serve the new linkspan. CalMac have responded basically, "no chance". There is also still no indication on when the 'preferred bidder' would be chosen, despite previous assurances from the Minister that this would be announced 'in the Spring'. A spokesman for the Executive said: "The Executive has recently finished evaluating the information that was submitted to us by the three organisations that remain in the bidding process for the Gourock-Dunoon route. "We are now considering which organisations should be taken to the next stage of the process and invited to submit a technical bid. "Once this process is complete, we hope to be in a position to invite technical bids shortly." The Dunoon Observer notes that the delay in the process also makes it likely that the timescale for the opening of the new service will slip even further. Comment: there is little chance now of any firm other than Western being seriously interested in the route The Executive would also impose contractual restrictions and obligations on any unsubsidised operator on what is presently the Calmac service, whether or not this is CalMac - but no restrictions on Western on this route. Just one of the many problems that would dissuade an operator is that they would be tied down to a timetable and other obligations, but they would see little to stop Western from transferring some of its services to run between McInroys Point and Dunoon Breakwater, albeit temporarily. Just a few peak period runs here by Western could cream off much of the valuable peak period traffic from Dunoon and ruin any second operators business plans. No operator fully appraised of these risks would take the chance. This posted 24th March 2006: The letter setting the record straight from my two co-authors and me (see post for 19th March below) published in full in the Dunoon Observer today. At least this is now a matter of public record, no-one deserves the credit for this debacle except those really responsible - the Executive. This posted 19th March 2006: In a bizarre twist, political literature is circulating in Argyll and Bute crediting me with the Executive's proposals for this route, which is ironic, risible and plain wrong and highly misleading given the criticism I have made of the Executive's proposals for Gourock-Dunoon on this website (see below) and in correspondence to the Executive over the past several months. The offending literature is copied here and the response with my two co-authors is here. This posted 23rd February 2006: The Scottish Executive finally release (after delays that breach the 20 working day reply rule) information requested by Jim Mather MSP on the "Users' Charter" meetings between Western Ferries and the Executive in 2004 and 2005 - essentially, discussions about Western getting a monopoly on the route at a time when the Executive was supposed to be promoting competition on the route under EC rules. The documents supplied by the Executive are reproduced here, while my comments on them are reproduced here. While the documents are in some cases heavily edited and others suppressed, there is enough in them to suggest that the statement of 13th January 2006 (that these discussions were deemed no longer relevant after the decision to invite other commercial interest in the route) was misleading. This posted 2nd February 2006: a Google keyword search has revealed the name of the public spirited person whose persistence under FOI legislation finally confirmed the scandal of public subsidies helping to protect Western's private profits (see next paragraph). All is revealed here. This posted January 31st 2006: those interested in the current UK Minister of State for Transport and Secretary of State for Scotland's views on Gourock-Dunoon might find the Minister's views expressed while an opposition MP in online Hansard of interest. (see Column 1014-1016) The fact that Competition Policy is a reserved matter should also be of interest in this respect given that Mr Darling is both UK Minister for Transport and Secretary of State for Scotland and presumably has continuing interest in these matters. This posted January 12th 2006: As noted for Tender 3, in my Comments letter to the Minister I suggested what could and should be done here now and my Note of 12th January presents a way forward both for this route and Campbeltown-Ballycastle. This posted end December 2005: Jim Mather MSP asked in a written question to the Scottish Executive "whether it has discussed the prospect of creating a Users Charter with any current or potential ferry operators and, if so, which operators were involved and when the discussions took place". The Minister Tavish Scott replied; "Proposals for a Users Charter relating to the services provided by Western Ferries between Inverclyde and Cowal were submitted to the Scottish Executive and Argyll and Bute Council by Western Ferries in 2004 and were the subject of subsequent discussions". The "Users Charter" was what Western promised if they became the monopoly operator on the route. This does raise the question of why private discussions were being held with one operator at this highly sensitive and crucial juncture in the development of the service, especially when the topic of the discussion was associated with the creation of an unregulated monopoly of ferry services on such a strategically important route. The documents on the "Users' Charter" meeting released after appeal to the Scottish Information Comissioner are here. For my short summary and later detailed analysis see here. The Scottish Information Commissioner's Decision on this issue is here. For those who would like further background on the saga of the Gourock-Dunoon Clyde crossing, see here for a compilation of the Gourock-Dunoon saga August 2004-07 based on extracts taken from the online version of the Dunoon Observer. The original Executive announcement in December 2004 of the plans to invite non-subsidised operators along the lines suggested in my FSB/DGFG report with Captain Sandy Ferguson and Ronnie Smith CA (see below) is here and the renewed announcement is here. See also the Gourock-Dunoon Appendix on my Europa Institute paper. Again, more on the background problems, likely outcomes and a feasible solution for this and the other tenders in my Comments letter. Also, The Economics of the Gourock-Dunoon Ferries is an analysis of the economics of the route which I wrote with Captain Sandy Ferguson and Mr Ronnie Smith CA, while Gourock-Dunoon, 23 Questions, 23 Answers and a Conclusion is a note on the implications of the Executive's short-lived programme of market testing for the route before the "Users' Charter" meetings were pulblciy known about. The views here are my own and do not necessarily represent the opinions of any other parties. For the record, I have been offered several (unsolicited) paid consultancies on Scottish ferry services in recent months, have turned each down because I genuinely believe the Executive's proposals here threaten the public interest and I wish to remain a free agent to express my views on these matters (there are plenty others who are happy to accept or seek such consultancies, which is why you should always second guess unsolicited public pronouncements in the media by specialists in these matters). I have had confidential discussions with ferry companies where I felt it was in the public interest to do so, including accepting confidentiality agreements where this was requested (unusual, given I was not receiving fees). I will not assist cherrypicking. A PSO (Public Service Obligation) has been compared to a driving license. Just as you need a valid driving license to drive, EC law requires a valid PSO to subsidise EC lifeline ferries. A PSO represents an obligation which a ferry operator would not adopt if they were considering solely their own commercial interest, for example holding fares down to a certain level, running a service with a minimum level of frequency, or running the service all year round. It is recognized in EC law that a case can be made for imposing PSOs to help support vulnerable communities for economic and social reasons. The route-specific nature of most PSOs mean that for that reason PSOs are typically specified at that level, even if the routes are subsequently bundled together in a single tender. The evidence from other EC countries is that it can take significant time and resources to establish, define, and justify PSOs. Once a valid PSO is defined, subsidy may be permitted for operators, but only sufficient subsidy to compensate for the carrying out of the PSO. A PSC (Public Service Contract) can help support delivery of lifeline ferry services. However a PSC is not a substitute for a PSO or PSOs. If compensation (subsidy) is to be offered for operating on a route, a clearly defined and valid PSO must be specified in advance of the PSC or tender. Any subsidy in excess of the amount necessary to compensate for the PSO may be judged illegal State aid by the European Commission in Brussels. If no PSO is specified, all subsidy is open to interpretation as illegal State aid by Brussels. Much of the first Scottish Parliament (to Spring 2003) was spent on justifying PSOs on lifeline ferry services, including mainland to mainland routes. It was assumed by most informed observers that the Executive was continuing to prepare the case for PSOs on a route-by-route basis during the second Parliament from Spring 2003 up to today, whether or not tendering was required. But in an answer to a Written Question the Minister Tavish Scott stated June 13th 2006: Public Service Obligations (PSOs) would not provide that certainty and security of service nor deliver on the Executives key policy objectives. Consequently there is no need to consider, nor do we intend to consider, issues arising in relation to PSOs. This was confurmed in a written answer by the Commission to Alyn Smith MEP (6th October 2006) which confirmed that the imposition of a PSO on a route is a precondition for any subsdiy to be given. In summary, two simple points: (1) PSOs are necessary if you want to subsidise EC lifeline ferry services but (2) the Executive says there is "no need to consider, nor do we intend to consider, issues arising in relation to PSOs". The implications of these two simple points will be profound, not just for the Executive, but also for all the users and communities dependent on these lifeline ferry services. Pre-1992 The EC debates formulation of 1992 Maritime Cabotage Regulation. 1999 Correspondence from the Commission to the Executive indicating that subsidies to Scottish Lifeline ferry services may be in breach of 1992 Maritime Cabotage Regulation. 2001 The European Court Trasmed ferries case indicates how PSOs may help justify subsidy and exclusivity on public service routes in the EC. 2002 The first Draft Invitation to Tender for CalMac services is published and notes Commission guidelines say that subsidisation here can in principle be accepted for PSOs. 2003 The EC Communication is published confirming the role of PSOs in justifying subsidy and indicating how the CalMac peninsular routes (Tarbet-Portavadie and Gourock-Dunoon) may now be recognised for PSO status and so be subsidised. 2005 on the question of exclusivity, the Executive informs Local Government and Transport Committee of Scottish Parliament that they have "no powers at present to restrict any operator that wishes to operate any service (on the CalMac routes)"
2006 (June) The Minister states regarding the tendering of CalMac services: "Public Service Obligations (PSOs) would not provide that certainty and security of service nor deliver on the Executive's key policy objectives. Consequently there is no need to consider, nor do we intend to consider, issues arising in relation to PSOs". 2006 (August) The EC's Transport Spokesman reported in the Herald and the Press and Journal says: "Companies have to be able to compete and know in advance what the subsidy is exactly paid for. The purpose of the subsidy has to be specified in the PSO. So yes, a PSO is needed before one can pay out public service subsidies for ferry services". 2006 (October 6th).... And CalMac itself in its Annual Report published today agrees with the Commission statement above "the European Directive on maritime cabotage ... provides that State Aid may be paid only to fulfil a Public Service Obligation ..."
2006 (October 10th). The Commission answers a question on this issue by Alyn Smith MEP; "compensation may be granted to operators to cover the costs involved in meeting public service obligations. The imposition of public service obligations is therefore a precondition for any compensation being given". Clydesite Interesting, informed and lively website on shipping and ferry issues on the Clyde and elsewhere. V.Ships Major international supplier of shipping services now believed to be the only serious rival to CalMac for the CalMac tender..
Local Government and Transport Committee of the Scottish Parliament. Along with its predecessor committee, carried out two Inquiries into the proposed tendering of CalMac routes in 2001 and 2005, it is very much to be hoped that they continue their scrutiny into the proposed tenders and monitor Executive policies and practice in these areas. Bute Users Ferry Group. a model for how a users group should be organised and work. I wish the Executive was half as professional. The 2000 Trasmed Case which showed how PSOs here should be specified, and appropriate subsidy for these PSOs calculated, with or without tendering. Answers from the Commission and the European Court contains excerpts of material of relevance to the issues discussed here. PSO Crib Sheet is my effort to summarise the issues surrounding the Executive's decisons not to use PSOs for lifeline ferry and air services. And in The Invitation to Tender for the CalMac Network I look at how cherpicking will lead to the dismantilng of the CalMac network. The next two paragraphs posted 31st January 2006: in a Decision, on request for informatiion under FOI legislation, the Scottish Information Commissioner states in para 55. "I agree that cherry-picking of its routes is a threat for Caledonian MacBrayne, and that where and when competition is introduced on a route, its effect on Caledonian MacBraynes commercial interests will be significant. A knock on effect of this may be the need for additional subsidy to be provided if the existing level of service provision is to be maintained". The Commissioner is right, but it is the responsibility of the Executive to do something about this, not the Commissioner. Such as? Vehicles, freight, summer season, short crossing. The higher the volume of traffic on a route, the more likely it is to attract cherrypicking interest. What don't cherrypickers like? Foot passenger traffic. This can be low revenue, high cost to provide for, and often involves expensive longer crossing to connect with other forms of public transport. What would be the effect of cherrypicking on Scottish ferry services? Cherrypicked parts of routes generate private profit, leaving the publicly subsidised service having to pick up the leftover essential services on the route at higher cost and subsidy (e.g foot passenger traffic). Who complains about subsidising public ferry services such as CalMac? Mostly cherrypickers. Who seeks information on Scottish ferry services under the new Freedom of Information legislation? Mostly cherrypickers. What is the view of governments on cherrypicking ferry services? Brussels, Westminster and the Executive all say it is undesirable and an inefficient form of market entry. What has the Executive done to prevent cherrypicking? No obvious steps, despite warnings and actual attempts (and many threats) to cherrypick..
Also see discussion of Scotland and air PSOs in context of how just about every other country in Europe in EC does it. Here is how it should be done and here is a short article of some of the benefits. See here also a useful presentation on PSOs for Scottish air services and the "compelling case" for such PSOs from Highland Council. See the paper from Cranfield about how Scotland compares with other EC countries in these regards. And finally, here is a Note (December 4th 2006) showing how and why the Executive got the air PSO issue so very wrong, on legal, economic, and social grounds. Comments and communications from others interested in these issues welcomed. However, putting my e-mail address directly on this website is an invitation to spammers and their robots "harvesting" addresses from websites. I have also found that webmail addresses from a web host can be very unreliable. So I am "munging" my personal e-mail address (see munging link for more on this). Think of it not as an inconvenience, but one more victory for the good guys over the bad guys. You can test e-mail me as subject "testing" or "brocher" to AOL in the first instance just to make sure you have it right so you don't waste time unnecessarily, and I'll confirm.